Two nights ago, Ian had a major ischemic stroke but because we were at Mijares (two blocks from Huntington Hospital) and I recognized the symptoms (training) he got help as immediately as is possible. He was paralyzed on his left side. They started him on tPA and he regained some ability. Yesterday his neurologist was very excited to see how well he's doing. She called him, "90% back". He'll be at Huntington for a little while. He'll need rehab and physical therapy. She said that as long as he puts in the work required he'll be 100% again. Today Ian was moved out of ICU to the Neurosciences Stroke Center within the Huntington Hospital. He's much better today. He's cooperating and gaining strength. His face looks good. His speech in a little slurred because the left side of his mouth is still effected. This doesn't stop him from conversing -- nothing can. He's reading. He can swallow and has healthy meals. He hasn't had a good night's sleep yet but tonight should be OK. He's been assessed and there will be more tests tomorrow. He'll be right as rain in no time. I'll try to report every evening. If you would like to send Ian a card -- please do. He would love it. Honestly, it would make a huge difference in his recovery. Send it to PO Box 451, Altadena, CA. 91001. I don't know how it should be addressed if you want to send it straight to the Huntington. He's a Superman; don't worry. Attention ukulele detectives. 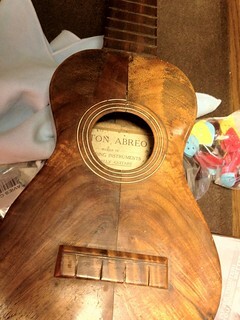 Among several dozen vintage ukuleles that are on consignment at Lamorinda Music is this mysterious baby. Here's what I can tell you about the instrument. It appears legitimately old (someone clearly has played the heck out of this for years and it arrived with the vestiges of old gut strings imbedded in the bridge) and really heavy compared with early ukuleles. The soundhole rings may be ivory, and the grooves are cut so deeply that the wood has separated behind them. It has a metal saddle. The geared tuners appear to be later additions.